Get your daily scoop of what we're watching for February 26, 20014. 1. Arizona's anti-gay bill. Pressure is growing against a measure that would allow the Grand Canyon state's retailers to refuse service to LGBT customers based on the owners' religious convictions. More than 80 businesses have sent a letter to Gov. Jan Brewer urging her to veto the bill. 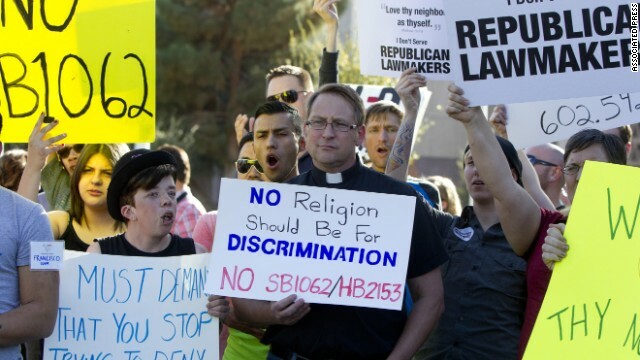 "When the legislature passes bills like this, it creates a reputation that Arizona is judgmental and unwelcoming," the letter said. "This will haunt our business community for decades to come." The Hispanic National Bar Association is also pulling its 2015 convention from Phoenix to protest the bill. Brewer must sign or reject the bill by the end of this week. 2. The Hillary bandwagon. A cadre of Democratic groups is coalescing around a 2016 White House bid by Hillary Clinton, even though she hasn't said whether she'll run. The groups include the PACs Priorities USA Action, Ready for Hillary, Emily's List and Correct the Record. But some Democrats are concerned that the early effort focusing on Hillary presidential campaign is taking the focus off the 2014 midterms. "With the Senate seriously at risk, and the Koch brothers spending prodigiously, shouldn't Dem fundraisers be focused on '14 and not '16 races?" former Obama White House senior adviser David Axelrod tweeted. 3. Speaking of 2016… More Republicans would prefer that New Jersey Gov. Chris Christie stand down on a White House run. According to a new CBS News/New York Times poll, 41% of Republicans says Christie should not seek the GOP presidential nomination, while 31% say he should. It's the latest indication of Christie's fall as the 2016 Republican frontrunner since the scandal broke on his administration's alleged orchestration of a massive traffic jam on the George Washington bridge last September. Christie has denied knowing anything about the incident until after it occurred. For his part, Christie is brushing off his drop in recent polls. "The only two professions in America where you keep getting paid even when you are always wrong affect my life everyday – pollsters and weathermen," the governor said at a town hall. "I mean, they don't ever have to get it right and then they come back the next day and they sound as authoritative as they used to right?" 4. House GOP pounces on the IRS, tax reform. House Republicans are unveiling a plan that would cut individual and corporate tax rates while raising revenue. The proposal, introduced by House Ways & Means Committee Chairman Dave Camp (R-MI), would reduce individual and corporate tax rates while still raising revenue by imposing a surtax on some income above $450,000. "The debate about needing to do tax reform is over," said Camp. "We've already lost a decade and before we lose a generation, we must enact meaningful tax reform to get this economy back on track." Could this be an issue that push voters buttons this midterms? Stay tuned. 5. (Don't) Give me that old time religion. Millennials are walking away from religious affiliation at a higher rate than older people. The main reason: LGBT rights. A new survey by the Public Religion Research Institute finds that one-third of millennials under the age of 34 left the faiths they grew up with because of "negative teachings" or "negative treatment" regarding gays and lesbians. The survey also found that 58% of Americans believe religious groups are pushing away young adults by being too judgmental on gay and lesbian issues. That figure jumps to 70% among millennials.